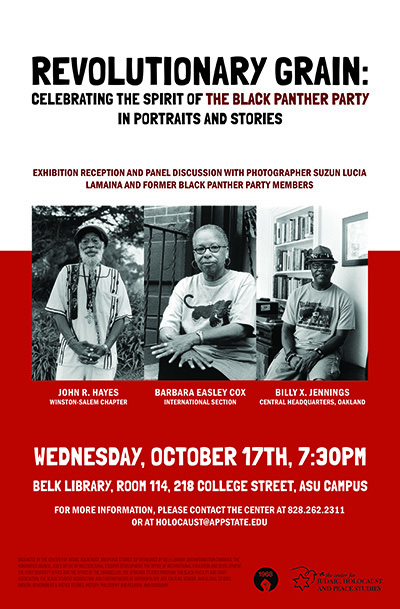 ASU's Center for Judaic, Holocaust and Peace Studies is hosting a reception and panel discussion on "Revolutionary Grain: Celebrating the Spirit of the Black Panther Party in Portraits and Stories" in Belk Library, Room 114, on Wednesday, Oct. 17, 7:30-9:00 p.m.The panel includes BPP veterans Barbara Easley Cox (International Section); Billy X Jennings (Oakland headquarters), and John R. Hayes (Winston-Salem chapter). It is part of the program accompanying -- with Belk Library and Information Commons -- a travel exhibit by California-based photographer Suzun Lucia Lamaina, which will be on display at Belk library from October 15 until December 15. Lamaina spent five years traveling the country to meet with and take portraits of veterans of the 1966-founded party. The exhibit is geared to engage community audiences and students and "create a dialogue with them about the Black Panther Party." The event, which is also part of the Center's series to commemorate and critically appraise the global uprisings of 1968, will shed light on past and present racism across the United States, police violence and community responses, and the challenges of political organizing and coalition building, especially Jewish-African-American collaborations. 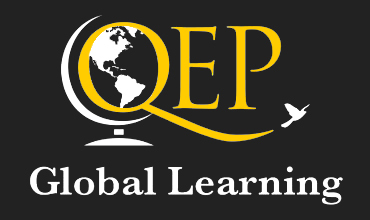 The events co-sponsors include ASU's Office of Multicultural Student Development, the Office of International Education and Development; the Africana Studies Program; the Black Student Association, and many others. 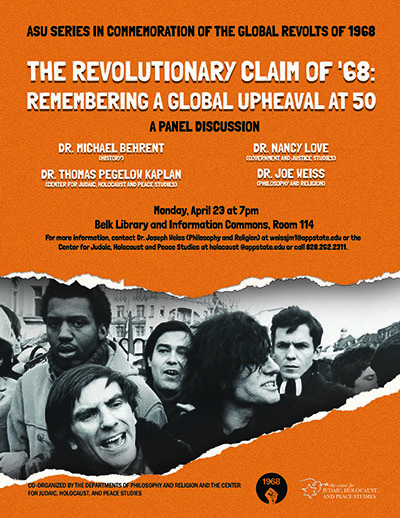 As part of ASU's Series to Commemorate the 50th Anniversary of the Global Revolts of 1968, the Center for Judaic, Holocaust and Peace Studies has joined the Department of Philosophy and Religion in co-organizing a panel discussion on "The Revolutionary Claim of '68: Remembering a Global Upheaval at 50." Panelists include Dr. Michael Behrent (History), Dr. Nancy Love (Government and Justic Studies), Dr. Thomas Pegelow Kaplan (Center for Judaic, Holocaust and Peace Studies), and Dr. Joe Weiss (Philosophy and Religion). The panel will begin on Monday, April 23, at 7:00 pm in Belk Library and Information Commons, Room 114, first floor. For more information, contact Dr. Joseph Weiss (Philosophy and Religion) at weissjm1@appstate.edu or the Center for Judaic, Holocaust and Peace Studies at holocaust@appstate.edu or call 828.262.2311. As part of the 70th anniversary of the founding of the state of Israel, the Center for Judaic, Holocaust and Peace Studies is partnering with the local Hillel chapter for a panel discussion on "Israel at 70: Achievements, Challenges and Conflicts." Panelists include Prof. Ryan Curtis (Government and Justice Studies) and Center Director Prof. Thomas Pegelow Kaplan (CJHPS). 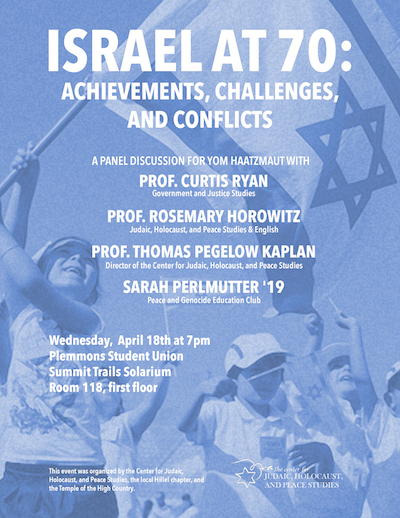 The panel will begin on the eve of Yom Haatzmaut on Wednesday, April 18, at 7:00 pm in the Plemmons Student Union's Summit Trail Solarium, Room 118, first floor.